I purchased two of these nightstands and they look just like the picture. I am very pleased with the construction and quality; they are made well. Best of all they shipped already put together (aside from the handles/pulls) and might I add the packaging was top notch as well! The one thing that takes some getting use to is closing the drawers, you have to give them a firm push for them to close entirely...they have the effect of soft-close drawers, but I guess that's the "Ball Bearing Metal Glides" feature at work...maybe as they're broken in the firm push won't be necessary. Can't wait to purchase the matching canopy bed! 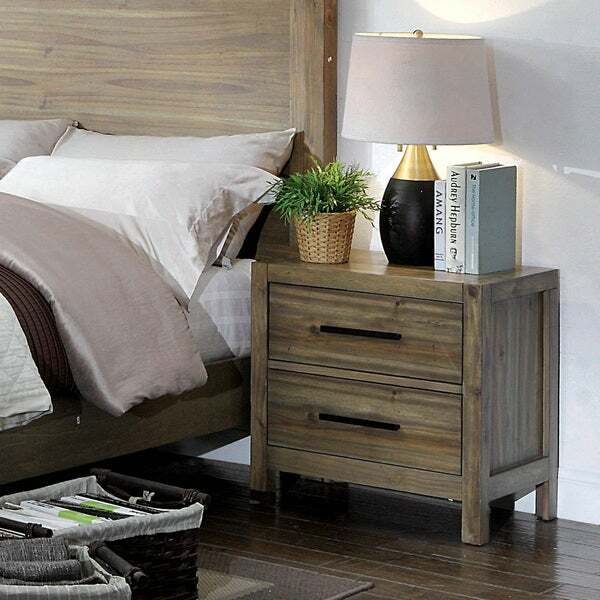 Enjoy that farmhouse vibe no matter where you live with this Furniture of America Holstead Rustic Nightstand. Recessed wood panels show off the rustic light oak finish and its noticeable grain. English dovetail construction on the drawers provide a well built, durable structure that moves smoothly along ball bearing metal glides. The top drawer is ideal for special or fragile items with its felt lined interior. Dimensions 23.63 In. X 15.75 In. X 24.0 In. I bought these along with the matching canopy bed. Both pieces look very nice in my guest room and I got it for a great price. The only thing I would say is that if I were buying this for my room I would wish the drawers were a bit larger but that being said it works fine for the purpose I bought it for.